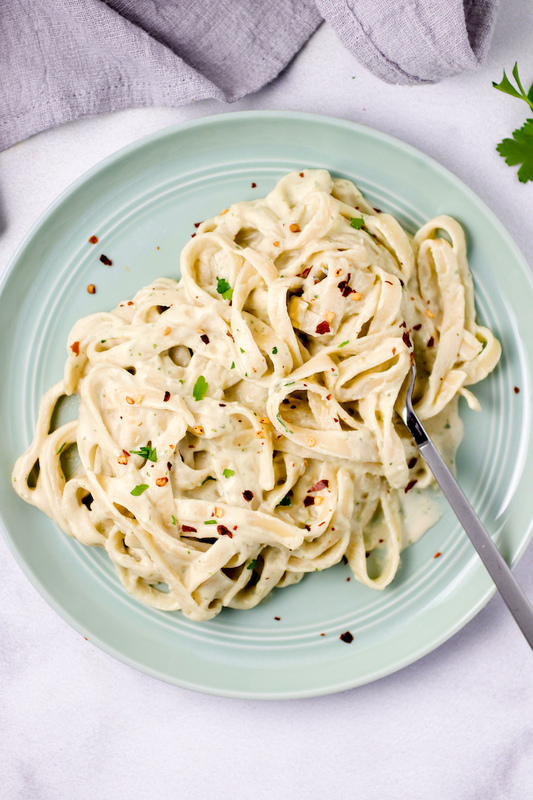 I do still love fettuccine alfredo! Really any good cream sauce, but I don’t have the metabolism of a 12 year old anymore (that was nice) and it’s so heavy on my stomach! 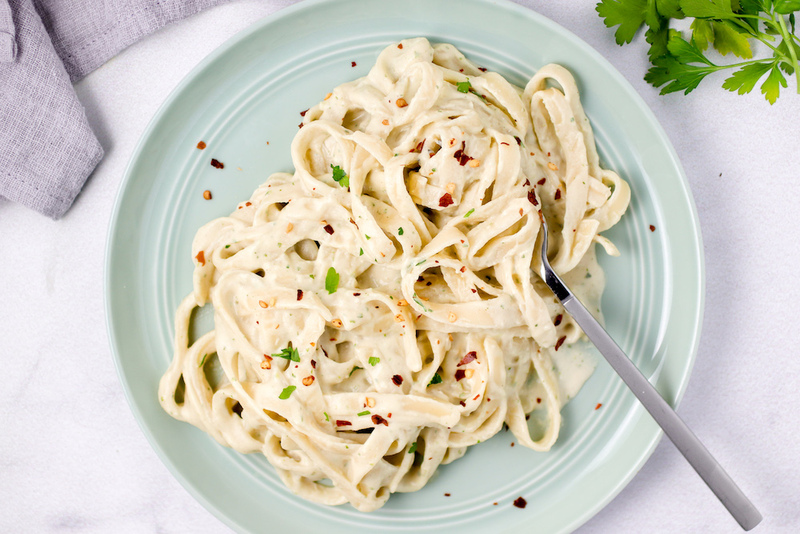 So I’ve been making this dairy free creamy cauliflower alfredo sauce that is way lighter but still delicious! And if you hate chopping cauliflower because it gets all over out kitchen (me) then just grab a pre-cut bag of florets! Remove the cauliflower from the stem and place it in a pot with two cloves of garlic. Add ½ inch of water and steam until very soft for 30min. 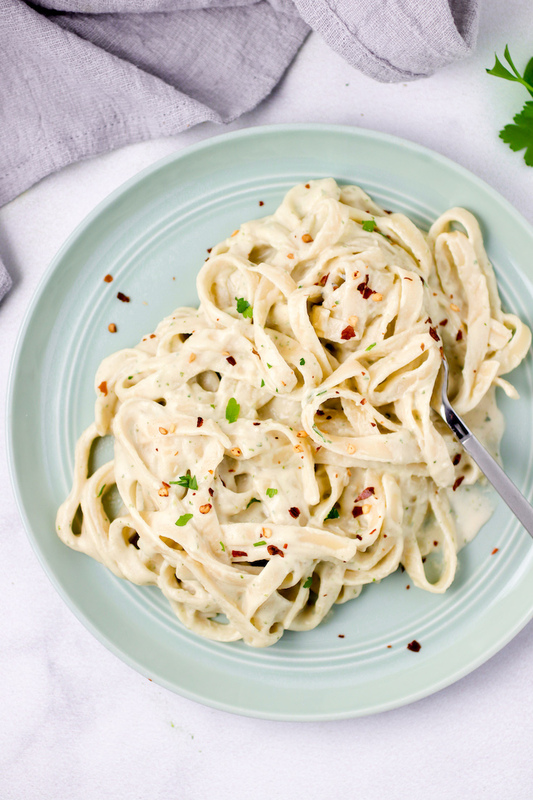 While the cauliflower is cooking, bring another pot of water to a boil and cook the pasta. Remove the cauliflower from the heat and drain out any remaining water. Add the cauliflower and garlic to a blender or food processor with the olive oil/butter and blend until a smooth puree forms, 3-5min. Add some of the almond milk if needed to aid with the pureeing process. Once the cauliflower is smooth, add 1 cup of the almond milk, the lemon juice, onion powder, parsley, nutmeg, salt, and pepper and blend until well combined. Slowly add in more almond milk to thin until a creamy sauce is formed. Add more garlic powder and salt to taste if needed. Mix into the cooked and drained pasta. Enjoy! The amount of almond milk will depend on how big your cauliflower is!